Chinese President Xi Jinping paid a two day state visit (April 20-21, 2015) to Pakistan. The visit was first by a Chinese President in nine years.President Xi Jinping's two day visit to Pakistan has, therefore, put stamp of China's final success in achieving its decades old 'aspiration' of having its presence in the Arabian sea linking Pakistan's southern Gawadar port on the Arabian sea with China's western Xinjiang region through Pakistan-Economic Corridor, as during Xi Jinping's visit, Pakistan- China signed 51 Memorandum of Understanding (MOUs) worth USD $46 billion mostly relating to expansion of Gawadar sea port, developing its related infrastructure in Pakistan and for the energy sector. Intrestingly, Gawadar originally belonged to Oman, who had sold it to Pakistan in December 1958 for a price of 5.5 billion Pakistani rupees. 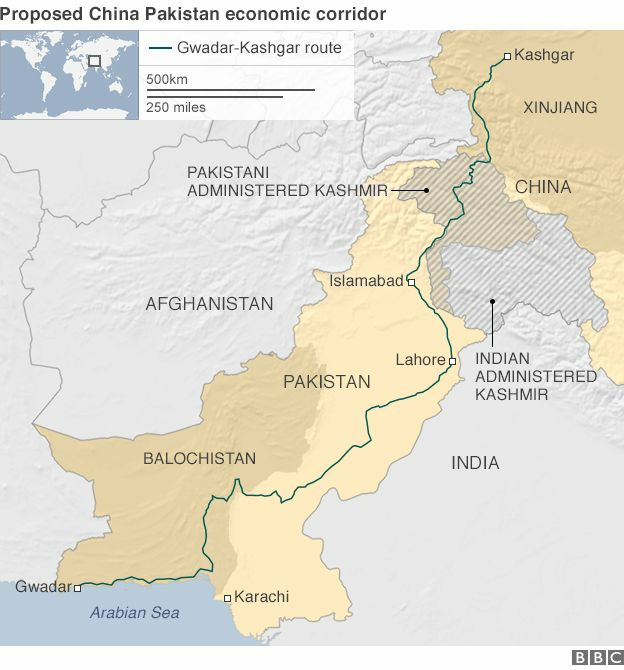 Notably, Pak-China corridor is an ambitious plan of President Xi, which included facilities at Gawadar port, second phase of upgrading of Karakorum Highway, Chinese aided motorway project between Lahore and Karachi, other rail line projects and some energy related projects. President Xi Jinping also addressed (April 21, 2015) a joint session of Pakistan Parliament. In his address, he hailed Pakistan for standing by China at a time when it was solated in the world. While claiming that Pakistan was not unfamiliar country to him, president Xi Jinping hailed bilateral relations between the two countries saying both stood by each other in times of need. Pakistan Government on 21 April 2015 conferred Nishan-e-Pakistan, top civilian award on Chinese President Xi Jinping. He was bestowed with this award for his outstanding contribution in promotion of relationship between the two countries by Pakistan President Mamnoon Hussain. The Nishan-e-Pakistan (Order of Pakistan) is the highest of civilian award and decoration given by the Pakistan Government. The award is awarded to a person for his highest degree of service to the country and nation of Pakistan. Former Prime Minister of India Morarji Desai is only Indian to receive this award. He was awarded this award in 1990.